Building Great Teams Starts with You! Space is limited. Register today to save your seats. Prior to the session, you will complete your Everything DiSC Workplace assessment*. 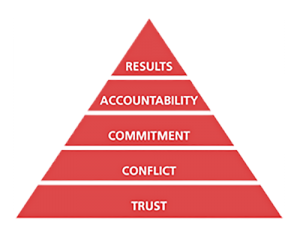 During our time together we will use our DiSC reports to examine how we influence TRUST, CONFLICT, COMMITMENT, ACCOUNTABILITY, and RESULTS. This event will equip you to contribute to building a more cohesive team by helping you understand your natural behavioral tendencies. Our goal is to highlight and encourage actions that benefit the team while simultaneously limiting the unproductive behaviors that we all exhibit from time to time (whether we recognize it or not). 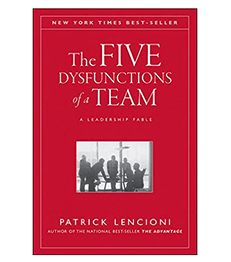 You will learn how to leverage this powerful framework based on concepts from Patrick Lencioni's best-seller, The Five Dysfunctions of a Team. Download the Blueprint for Team Cohesion here. * Each attendee must take an Everything DiSC Workplace assessment prior to the workshop. San Diego Humane Society has been working with Integris for more than two years and it's been a 110% positive experience. Nearly of our 600 staff members have completed Foundations of Team Cohesion and the impact on our culture has been nothing short of astonishing. We're lucky to have sent senior staff to an Integris event two and a half agos, and developed a partnership that I rarely see. I give Integris my highest recommendation possible. Over the past 8 years I have had the pleasure to work directly with the Integris team on a number of initiatives, from Lean Six Sigma training and project management to Leadership Development. Their latest effort related to improving Team Performance is a winner. I had the opportunity to participate in Foundations of Cohesive Team. It was a fantastic session, one that I would strongly recommend for any team that would like to take their organization's and employee's performance to the next level. Sr. Employee Development Advisor at So. Cal. Gas Co.
Our partnership with Integris has been amazingly beneficial to our organization. From Lean Six Sigma to The Five Behaviors of Cohesive Teams to The Leadership Challenge, they have helped our leadership grow and our organization become stronger. Integris has been our "go-to" partner for more than 6 years. Here's to many more years to come! WOW - what an amazing experience and remarkable gift! Thank you supporting San Diego Humane Society and offering this incredible opportunity to stretch our minds and hearts. We left the day energized, inspired, and motivated. Thank you for this extraordinary experience. We will carry our lessons forward with enthusiasm and fervor. I recently had the pleasure of working with Integris for a team retreat. It was by far the best workshop I've participated in throughout my professional career. It took theoretical concepts that traditional trainings provide and made it come alive! It was an interactive, fully engaging experience that was well worth the time away from the office! I immediately put into practice everything I learned. Thank you for a wonderful experience and I look forward to working with your group in the future. Questions? Reach out and we will get back to quickly.